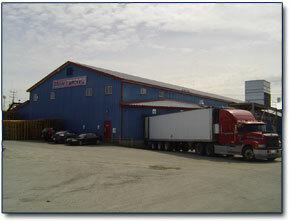 In order to respond to increased customer demands for quality cold storage warehousing and distribution needs in the new global market, the owners of Harbour International Limited decided to build their own cold storage facility which opened for business in Bay Roberts in the fall of 1997. Due to increased cold storage demand from our customers we have increased our cold stoarge handing capacity to 6,000 metric tons - that has 70% pallatized racking and is maintained at a temperature of -28°C or lower. 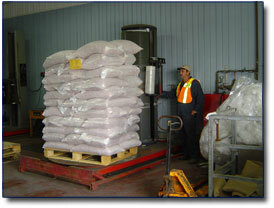 We have 2 seperate sorting areas with fully automatic stretch wrappers and weigh scales. Also, we have two modern inspection rooms used by our customers free of charge to inspect and analyze any products they have stored at our facility. 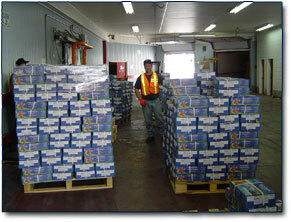 Moorfrost discharges 35,000-50,000/mt of frozen product every year -primarialy canadian & flemish cap shrimp. 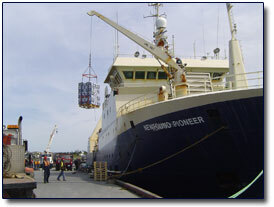 We have a highly skilled work force for discharging trawlers and handling product. We can discharge and handle up to 600 mt per 24 hour period. 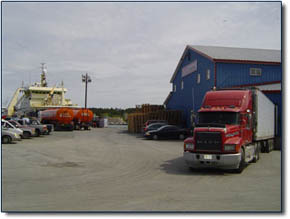 We operate our facility on 7-24 basis with no extra cost to regular customers. One 82 meter finger pier with 9 meters of water depth on boths sides. The finger pier has its own built in oil line for loading gas oil onto vessels and it has a fresh water line at the quay side for the supply of fresh water. One 50 meter marginal warf with 8.5 meters of water depth. The marginal wharf has a heavy lift area built into the quay that can accomodate a 300 mt lift crane. 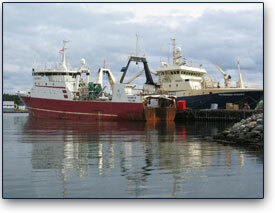 The largest trawlers calling Moorfrost for service are 70 meters long with a draft up to 9 meters. 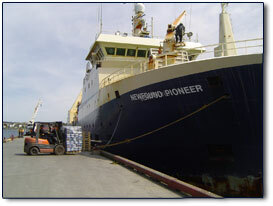 The longest reefer vessel calling Moorfrost for loading/offloading is 125 m long. 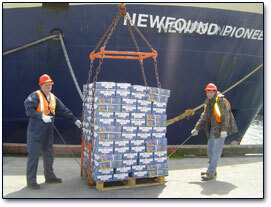 A growing number of customers from around the World now use Moorfrost for their various cold storage and shipping needs.